YouTube is working to increase video exposure and help audiences more easily find videos by giving creators the option to add hashtags to their titles and descriptions. 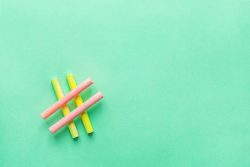 Hashtags should already be a part of your daily social media strategy, so these should be familiar to you, but read on for some best practices for this new feature on YouTube. Replace keywords in the title with hashtags. You have a max of 100 characters for your title, but the title should include one main target keyword, which will be representative of what your video is about. For example, if it’s a tour video you can use the hashtag #tour along with the band’s name such as #mybandtour or #mybandtour2018. Use hashtags in your description to emphasize elements of the video, as they can help users find your video more easily. For example, you can hashtag the genre of your music: #Pop, #Country, or #Latin, or add the type of release or name of the band or artist: #NewMusic, #2ndsingle, #myband. If there are no hashtags in the title, the first three hashtags in the description will appear above the video title. When adding tags or hashtags to your videos, be certain that they are relevant to the video and channel, as this will help improve the chances of your video surfacing in YouTube’s search results. These are part of SEO tools that can help the overall goal of maximizing views and awareness. If improper hashtags are used, your video won’t appear in search results. Hashtags must meet YouTube’s Community Guidelines in order to be added to any video title or description. When adding hashtags, be sure that they do not include spaces, misleading content, hate speech, or anything else that violates YouTube’s policies. Also, avoid over-tag— YouTube limits the amount of hashtags used per video to 15. If more than 15 are added, your video may be removed from search or from your uploads entirely — Less is more. Hashtags on YouTube will be hyperlinked and will lead to an overall results page when clicked on, surfacing every video that has the same hashtag. This feature will be available on both desktop and mobile, so you can enjoy the benefits at home or on the go! Watch here for more information.